Zombies have always been catchy. Those who read books and watch movies are often smitten with the lumbering, blood-thirsty ridiculousness that once was a human being. While those actually being chased by zombies can be caught and thus, "catch" zombie-ism through a series of bites. So, I have to believe that my zombie farmer vignette, in some way, inspired this series of zombie paintings by artist Brian Colin. 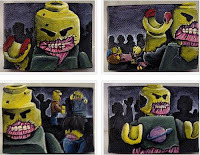 Although perhaps they were inspired by these oversized LEGO zombie minifigs. For those of you who can't get enough zombies, might I suggest BrickCon, a Seattle adult fan of LEGO convention that is expected to feature the second annual Zombie Apocafest group display.